Cleanings are a big part of dental hygiene and preventive care. At Corry & Lewis Dental, we recommend that you have one done at our office two times per year, approximately six months apart. By doing so, you’ll accomplish two crucial things: first, you’ll make the chances of new cavities and gum disease less likely; and second, any effects of existing gingivitis, the early stage of gum disease, will be reversed. Between your visits for our Cedar City teeth cleaning, keep your consumption of sugars and starches limited so that you don’t have too much dental plaque growing on your teeth and at the gum line. This sticky, invisible film is the primary cause of cavities and gum disease in the first place. Then be sure to brush your teeth when you first wake up each day, and again before you go to sleep at night. For your nighttime brushing, also floss thoroughly. The goal is to make sure that by the time you show up for our Cedar City teeth cleaning, you will have been regularly addressing dental plaque, leaving only tartar to be dealt with. Tartar is what becomes of plaque that escapes your oral hygiene efforts. 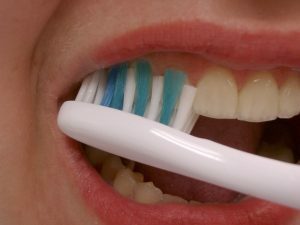 It’s hard and crusty, which means that your brushing and flossing will not be effective against it. A professional cleaning, however, will. This methodical elimination of tartar buildup on a six month schedule is key. Cavities develop over time, as plaque and tartar slowly but steadily erode your tooth enamel. And late stage gum disease is the result of unchecked plaque and tartar, along with not treating gum disease at an earlier point. There are few things as easy at our Cedar City teeth cleaning that do so much for your oral wellness. It’s quick, painless, and effective. Please reach out to our office now and schedule your next trip here.